While trying to find a place to display my brand new fish plate from Vietri, I suddenly had the urge to sprinkle pieces of sea glass around it. Perhaps, it's the jet lag, but it seemed like a good idea at the time. 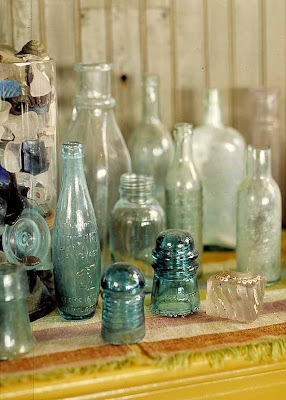 Sea glass is an icon of waterside decorating. In the same way that reindeer and Santa images immediately bring Christmas to mind, chunks of frosty burnished glass in shades of blues, greens and whites instantly conjure up summer for me. From trash thrown overboard by boats and refuse left behind on beaches that gets washed out to sea. After tumbling around in the waves it drifts back onto shore as a more beautiful entity. It also looks terrific used to give new life to chipped plates. I promise that I will get Mr. Linky up and running by next Wednesday so you can all participate. I apologize for not getting it together for this week, but I've been very busy signing and shipping copies of my book. 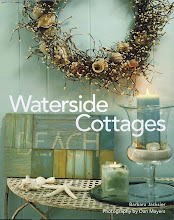 Please excuse my boasting but Waterside Cottages made Neilsen's Top 20 sellers at Independent Bookstores for July and hovered between #25 and #30 on Amazon's Bestselling Interior Design Books this week. 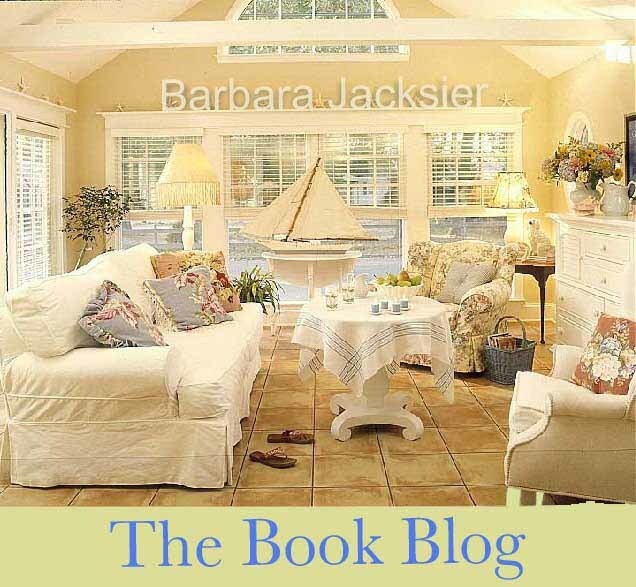 Dan says: "Everyone I know who has given a copy of Waterside Cottages as a host or hostess gift has gotten invited back to their friend's beach houses again. My friend Chuck even invited me back ... with the twins!" I am loving that fish plate! I have always loved sea glass. It has a time worn, casual look to it. Congrats on the book being in the top 20. I loved the book myself, so I was not the least surprised. I am happy that you are alright. I had a feeling that you might have been busy with your wonderful success. I am new to blogging and was just waiting for your special day. I look forward to joining you next week. Congrats on your book. It will definately be on my coffee table soon. You and Dan are so deserving! Oh Barbara, what great news..!!! You must be So proud.It's such a beautiful book.Congratulations.You deserve it.!!! I am really enjoying reading your book... the innovative uses for sea glass and shells are never ending... and I must say congratulations to you! on your book climbing the charts... not a surprise to any of us who know you ... I have not finished mine yet ...as I enjoy leisurely days of perusing its pages... but .... I am finding it both informative and downright fun! chock full of fabulous ideas too! I just received my book and it is beautiful! Will be spending the weekend pouring over each page. So many beautiful rooms and wonderful ideas! Congratulations. No wonder your book is 'climbing the charts' - I just love my copy. Love the featured sea glass in this post. I have a lot of seaglass and have it displayed so many ways around the house. 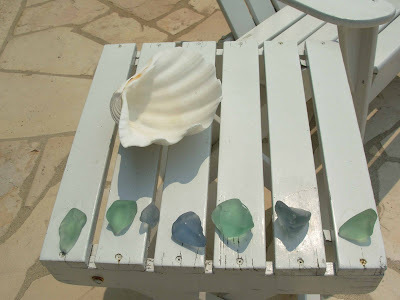 Love sea glass..., and many pieces @ Vietri..., as well as the story behind the company. The shoe...brilliant! Still glowing about your beautiful book. It's a stunner! I'm having a give away on my blog, please join us in the fun! 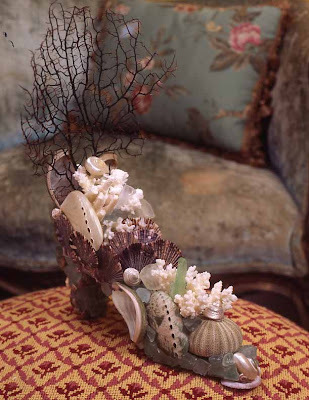 Hi Barbara, I just love beach cottage decor and shell designs. Your pics are very inspiring. This past Spring I framed an old vintage mirror with lots of shells and this hangs in my garden near the pool. Brings a bit of seaside and reflection to the area. Love the fish plate. Congrats on having your book in the top 20. I am not surprised. I do not have it yet, but plan to get it this weekend, if it still is on the shelves at B&N. Best wishes for continued great success! I've heard some wonderful reports on your book! I've enjoyed "Waterside Wednesday" over here, will be back next week. 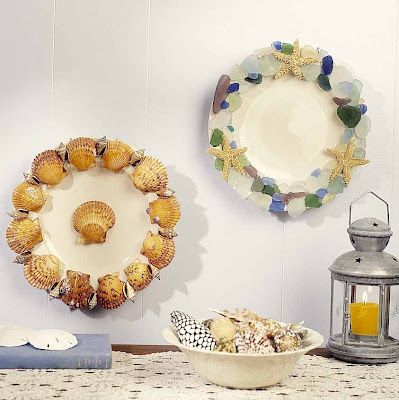 I am in love with the idea of putting the sea glass (or shells) on the plates, as I'm a dishaholic! Thanks for the lovely idea! Congratulations on your book being in the top 20. I am not at all surprised. I love your book and the beautiful inpirational photos. Thank you for the sea glass inspirations you shared. They are all fabulous and so easy to make. GREAT! on the ratings Barbara...whooo-hooo! hooray barbara! so happy to hear that the book is doing so well! i love beach glass and have discovered the best places to find it: dirty beaches! put on good shoes, pack the purell, and load up on beach glass. It's a three-way tie in my kitchen for favorite Julia recipe: Chocolate mousse, clafoutie and cassolet. Health foods, one and all! I received my copy and am really enjoying the book! congrats to you! I love sea glass !!!!!!!!!!! !